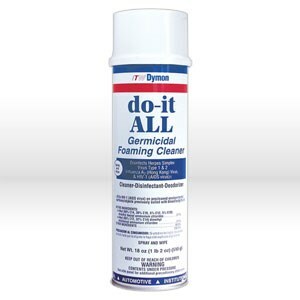 Do-it ALL germicidal cleaner is an EPA registered spray & wipe formula. Proven to clean, disinfect and deodorize, do-it ALL can be used on most hard, non-porous surfaces to leave them clean and free from odors. Safe to use in hospitals, institutions, meat and poultry plants and many other places. Cleans, disinfects and deodorizes in one step Foam clings to vertical surfaces permitting longer contact time Disinfects the following organisms on hard nonporous inanimate environmental surfaces: Herpes Simplex Type 1 virus, Herpes Simplex Type 2 (genital) virus, Influenza A2 (Hong Kong), Human immunodeficiency virus HIV-1, (AIDS virus), Staphylococcus aureus, Pseudomonas aeruginosa, Salmonella choleraesuis, Human Corona virus (HCoV). USE ON: Counter tops, table tops, plastic surfaces, sinks, bath tubs, wash basins, Formica, exhaust fans, stainless steel, finished woodwork, glazed porcelain, leatherette, plastic. USED IN: Hospitals, institutions, office buildings, factories, motels, meat and poultry plants. Leaves the surface clean and free from odors. Excellent for all bathroom fixtures, grouting tile, and shower stalls. Also excellent for cleaning vinyl, leather, and plastic upholstery, varnished, painted and enameled surfaces. Contains no abrasives.